Online data entry jobs are one of the best online jobs to make money on the internet without investment. Unlike other online jobs like paid surveys & freelance work, finding a reliable online data entry job is a milestone because most of the data entry sites are scammers. The main goal of these sites is to collect registration fees and cheat people. There are several real data entry job provider companies and sites available on the internet which is hidden on search results by spam blogs and scam companies. 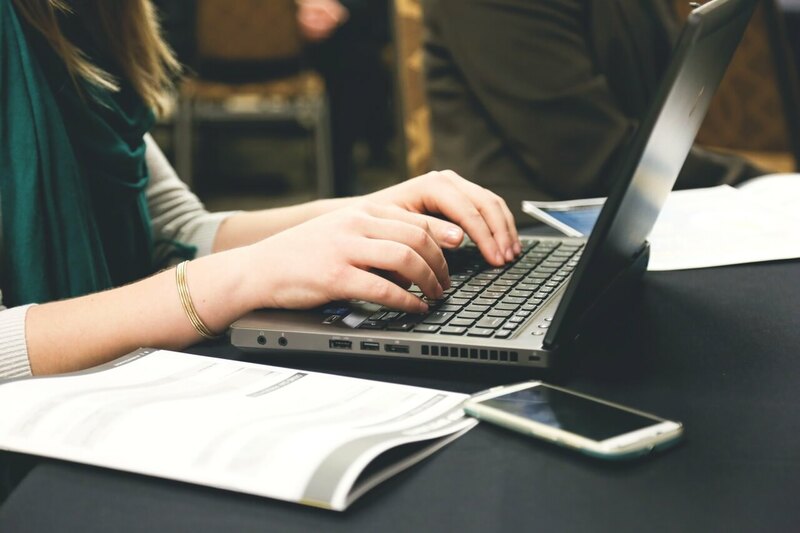 This article will help you to understand various legitimate data entry jobs available on the internet and find a best data entry jobs to earn money online without investing any cash. Data entry is the process of transferring or converting or changing or processing data from one form to another form. Data entry jobs are done manually or automatically depending on the complexity of the work. Physical to digital data entry is the most common type of data entry job. Entering data from books/paper to Microsoft Word, Microsoft Excel, Google Docs, Star office are some examples. Image to text data entry job. Entering text, numbers, symbol appear on the image into given software is an example of an image to text data entry job. Format conversion like PDF to Microsoft Word and vice versa is the best example. Now, these data processing are automated. PDF & notepad to MS excel data entry work is available in more numbers. Voice to text data entry jobs. This is also called as transcription, where the sound has to be converted into written form. Language translation is also a kind of data entry job, where the documents are converted from one language to another language. Content writing is a reliable online job. Writing articles using our knowledge and experience can help us to earn more money. Micro-tasks are tiny data processing projects where data are processed to form useful information. There are two types of data entry jobs, online data entry, and offline data entry. Working for a client or a company online with an active internet connection is called online data entry job. Working for a client or a company with or without internet connection using software that doesn’t require an active internet connection is called as offline data entry job. The procedure to find legitimate online data entry job provider companies is given below and here are the few tips to find fake data entry sites. Genuine companies will never collect registration fees from workers. Usually, job posting sites might collect fees from advertisers and not employees. Sites with colorful layout and payment proof will be scam data entry companies. Business class sites will be neat & simple and they won’t post any payment proofs. Refer scam adviser sites to learn the history of the company. Try to be on safer side by not trying new sites. You might also like this – Survey for money. These are the best sites/companies to find data entry jobs without investment. The first part is the list of data entry job provider sites and the second part contain job ideas. Snagajob is one of the largest online and offline part time job provider site in USA. They provide over four million part time jobs per month to job seekers. Snagajob is the best place to find both online and offline data entry jobs. Job seekers can join Snagajob without paying any registration fees and can apply for all the jobs that match their profile. To find data entry job on Snagajob, you can make use of the search filters available on it. 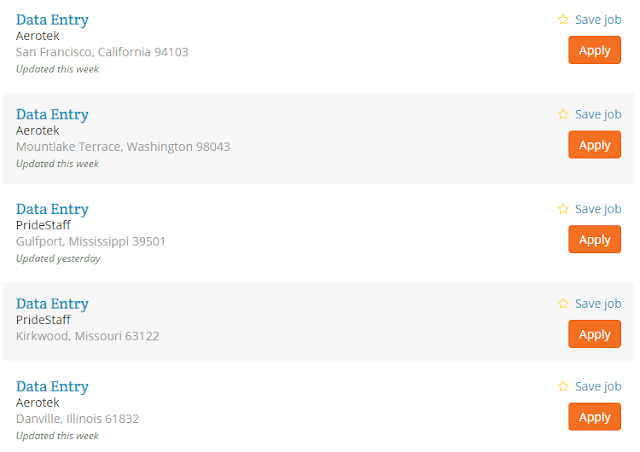 Also, you can use the location filter to find data entry job available in your area. Click on the job title you’re interested in and read the terms & conditions given by the advertisers carefully. If you have the full qualification, click apply. The employer will verify your application and hire you if they find your profile interesting. They might hire you as an hourly worker or part-time/ full-time worker. Apart from data entry jobs, there are several part-time jobs available on Snagajob for both educated and uneducated job seekers. These are the few examples of the jobs available on Snagajob tutoring, work from home jobs, office jobs, charted accountant, financial adviser, telemarketing, driving, banker, analyst, Manager jobs, etc. Unlike other online jobs, the employer from Snagajob will pay really good salary. Apply for part time data entry job on – Snagajob. 2Captcha is an online image to text conversion data entry job provider site which is also called as captcha solving job. The worker will be paid for each correct image to text conversion. When the members turn on working interface, the image will load on it. They have to enter the text/numbers given on the image inside the text box under it. After entering it correctly, the answer should be submitted by hitting the enter button. Images will continue to load after each submission. The members can solve as many captchas they can to earn more money. 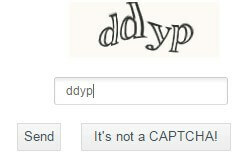 The member must be capable of solving a five letter captcha within 50 seconds to qualify. In simple, a member should able to type a letter within 10 seconds to be eligible. Captcha entry job is the most unreliable data entry job of all because they pay only 50 cents to a dollar for typing 1000 captchas which could take minimum an hour to complete. But captcha entry is placed higher on the list because anyone can join captcha entry job provider site to work without typing knowledge or special qualification. But to earn some money you must be able to type at a speed of 40 words per minute. Anything below this is a waste of time working on captcha sites. The minimum payout is just $1 and you can withdraw your money through PayPal, Payza, Perfect money, Web money, Skrill, Payoneer, Payeer, and more. Register to work on – 2Captcha. Fiverr is the one of the world’s largest digital product and service selling marketplace where anything can be sold worldwide for a minimum of $5. You can sell your data entry skills for $5 or more based on the complexity of the project. To work on Fiverr selling data entry projects it is not easy like you do on sites mentioned above. You must have exceptional skills in order to attract potential clients. 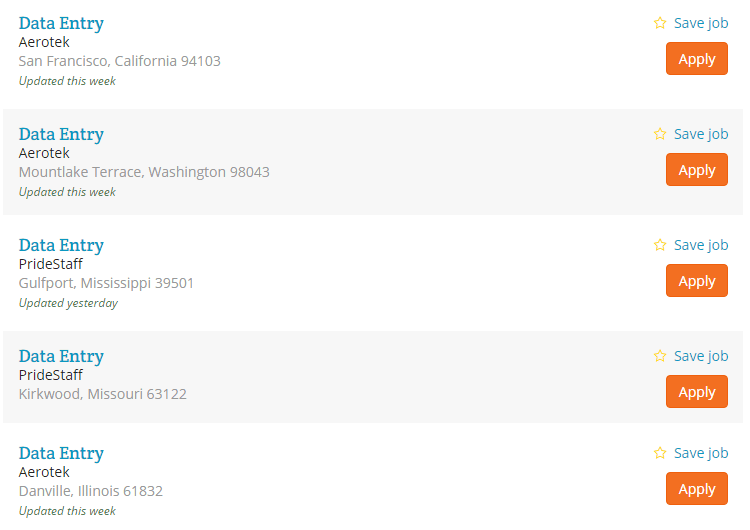 Look at the image below, an example of sellers selling data entry services on Fiverr. After buying the service, the clients will be asked to review your service. One to few bad review is enough to ruin your Fiverr business. So, use Fiverr only if you know what are you capable of and what you’re going to do. To attract clients who are in need of professional data entry services, you must create a gig on Fiverr. You must not use low-quality stock images, instead create an all in one banner or a whiteboard animation video. If you don’t know how to create one, you can buy a custom banner or an explainer video on Fiverr itself. You can sell data entry service of any type including MS Word, MS Excel data entry like converting Notepad, PDF files to Excel etc. Web research, content management, copy pasting are the other examples of data entry job. For instance, if you’ve planned to sell MS Excel-based service you must know each and every function of Excel, like formulas, cell management etc. Create your data entry gig on – Fiverr. The Amazon Mechanical Turk is one of the best sites to find the online data entry jobs. It is shortly called as Amazon mTurk. The Amazon mTurk is the place where a lot of clients post tasks called HITs which can be easily done by the human and not the computers. The tasks posted on the mTurk includes the data entry tasks, data processing tasks, data conversion tasks etc. The HITs found on the Amazon mTurk will be very simple even an uneducated person can do it and earn money without struggling. The Amazon Turker can choose the easiest tasks which they feel easier. There are unlimited tasks posted on the Amazon mTurk every day. So, many do this as a full-time job. The workers will be paid through bank account and Amazon gift card. Get the complete working guide for Amazon mTurk by clicking the link given below. Refer – Tips that work on Amazon mTurk to make money. Upwork™ previously Odesk is the world’s largest freelance marketplace where millions of freelancers and employers meet. Upwork™ platform helps employers to post their jobs and freelancers to find a job very easily. Tons of new jobs and projects of different categories are posted daily by the employers. Relevant freelancers can submit their proposal to get a contract. To find freelance data entry jobs on Upwork™, you must create an account on it. After creating an account, the first work is to complete your profile. Upwork™ never allows freelancer accounts with an incomplete profile to apply for a job. Add a good looking photo of your’s in profile and attach/link to portfolio to increase your score. Once the profile is 100% completed, upwork™ allows its users to find and apply for freelance jobs. Use search filters to find the data entry job. Read the requirements for applying for the jobs and if you’re eligible, submit the proposal. Like you, there will be several freelancers who would have applied for that job. The chances of getting a job will be very low unless your portfolio is unique. Search online data entry jobs on – Upwork™. Micro-tasks have now become a familiar online money making program on the internet. Doing microtask is very simple that anyone who can follow the simple instructions is allowed to do it. Micro-tasks are tiny tasks divided from a huge project to increase the accuracy of the work and reduce its complexity. These micro-tasks will be done by the community of members. For each task done, the member will be paid instantly. The results of the tasks will be regrouped and submitted to the clients. The downside of micro-tasks is, workers who are capable of working with certain accuracy only will be allowed to access higher level tasks which pay well. Each micro-task provider website will test their members for accuracy. Few sites will ask members to complete assessments in order to qualify to do tasks and some sites will allow their members to do tasks directly and if they find work accuracy is low, they might disable access to the particular task. So, if you wish to do data processing job on micro-task sites, work with full concentration to prevent potential tasks disabled. Do micro-tasks to earn money on – Crowdflower or Clickworker. Transcription is one of the interesting data processing tasks where the voice has to be converted to written form. There are two types of transcription which are live transcription and non-real time transcription. Transcribing the voice on real time when someone speaks it will be a live transcription. Transcribing voice or sound which already recorded is called as non-real time transcription. To do transcription task, the transcriber should have excellent reading, writing, and listening skills. Also, the typing and writing speed should be 70 WPM. Due to so many restrictions, only a few among thousands are selected for transcribing jobs and people with luck earn thousands of dollars every month. Earn by converting voice documents to text – Transcription jobs. Converting a language to another language is called as Translation. Online translation companies provide translation jobs to everyone with good translation skills. Usually, translators will be chosen only after several tests and assignment. Translating rare languages will be paid more compared to regular languages which are used widely all over the world. Most of the clients will pay on the pay per word basis. Translators can expect a minimum of 4 cents for translating a word. Use your language skills to earn money – Translation jobs. Content writing work is actually not a data entry job. It is more than data entry that it is equal to writing a book or a magazine. Instead of writing for a magazine, you will write an article for the internet blog. Top blogs are paying over $500 to the professional content writers who provide real value to their blog. Content writing will help to brand yourself. Top content writers with the huge number of followers start their own blog later and earn thousands of dollar every month. Learn – how to make money writing online. These are the best ways to find data entry jobs. People often struggle to find online data entry jobs and many failed to find a reliable paying data entry work. Hope this article have given you a clear idea about various top data entry jobs available on the internet and also the procedure to find each one without searching it again. Tags: Top 10 legit online data entry jobs without investment and registration fees, best data processing jobs, Ms word, Ms excel, PDF data entry work, how to find online data entry jobs that pay through PayPal, Payza, copy paste jobs.